The holidays are fast approaching and we have a series of posts coming to you that involve good gift ideas for the adventure traveler, national park enthusiast, city/small town traveler, international traveler and photographer in your life! 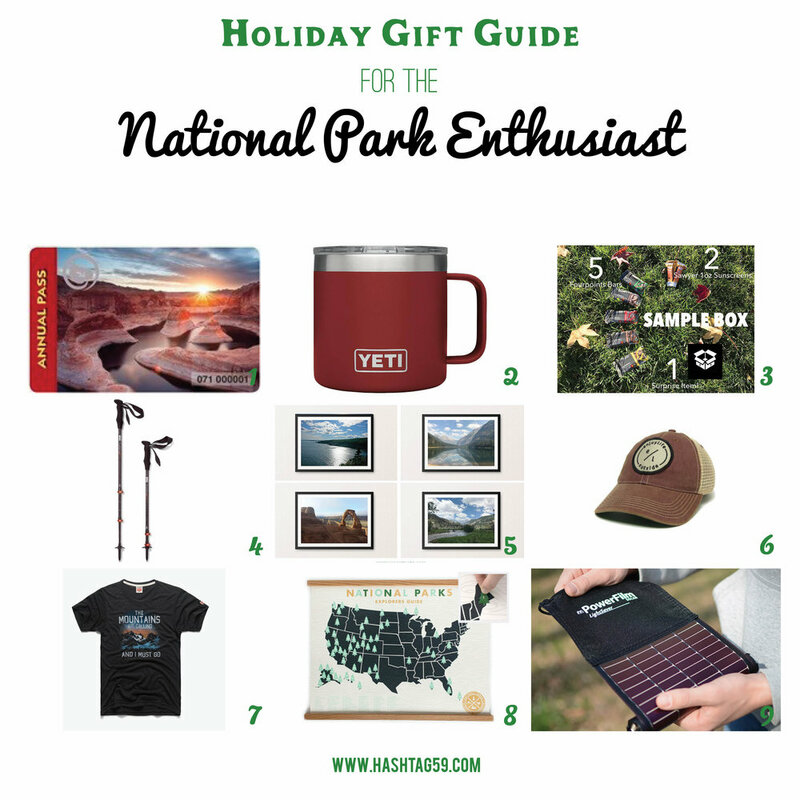 Next is our list of gifts for the National Park Enthusiast in your life. Since Hashtag59 got its name from the fact that there are 59 National Parks in America this is an exciting one for us! 1. National Park Pass: This is great especially if you know someone is looking to hit up at least 3 National Parks this year. $80. Mike R has used it AT LEAST 10 times each of the past four years when he has purchased one. And even if you don't use them all you are supporting a great organization. 3. Sample Box from 52 Hike Challenge: These would make great stocking stuffers! $29. And if you haven't checked this site out make sure you sign up for their 2018 52 Hike Challenge, we'll be a part of it! 5. 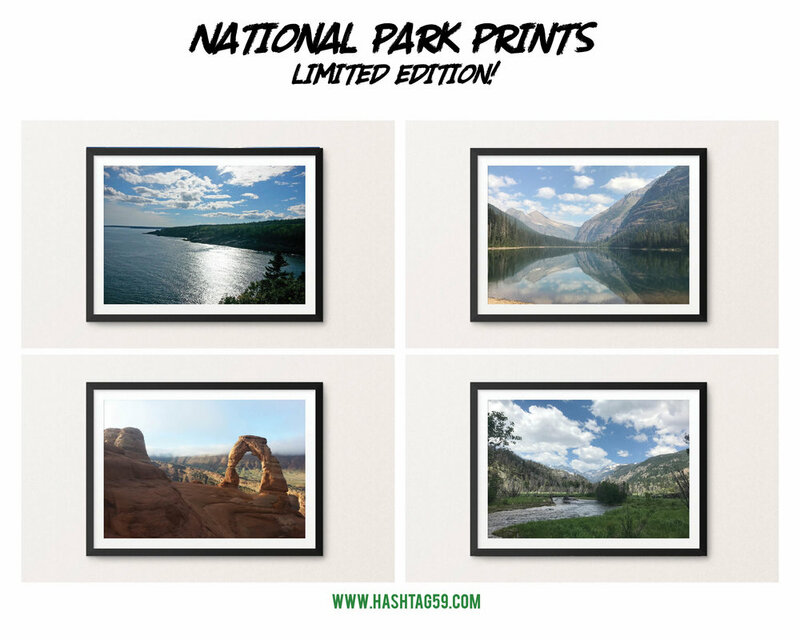 Hashtag 59 National Park Photo Series: Shameless plug, but we have a set of 4 limited edition photographs for sale! Here's Mike R in his Rocky Mountain National Park one! 8. National Park Explorers Guide: Mark off your National Park milestones on a nice map that the entire family can enjoy. $55 Here's Mike R's...looks like the dude has some work to do in Alaska! Maybe a Hashtag59 group trip?? 9. Lightsaver Portable Solar Charger: $99 An incredible product that is easy to use and good for the environment. You can watch a review HERE by Mike R on using it. Any you would add?? Put your comments below and check out our prints store HERE! Thanks for reading and being part of our community. Happy Holidays All!